With just over 16.5 million new vehicles sold in 2014, the US auto industry has returned to its pre-recession strength. Certainly, there is room for additional growth with 17 million units within reach. The auto industry is back and has returned in a significant way. Models such as the Ford F-150 and Toyota Camry receive much press and they should: both are perennial segment leaders, the F-150 for nearly four decades running and the Camry for the past 13 years. Beyond the two leaders there are several other models that shine, including the following five that made a mark in 2014. 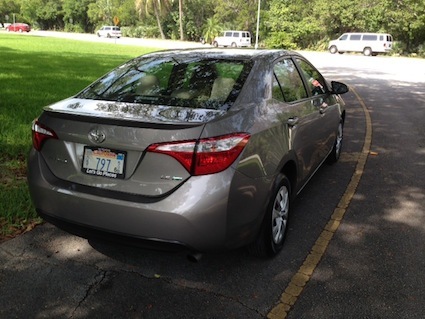 Toyota’s Corolla has long served as a portal model to the Toyota brand. Purchase a Corolla, keep it for years, upgrade to a Camry and then pass your Corolla on to your son or daughter. This model’s reliability is of legends and it has the facts to back it up. For some buyers, moving up to a Camry or any other vehicle is not part of the equation. Beginning in 2014, Toyota restyled the Corolla, making it slightly larger, sportier and an even better value than previously. Its most efficient model is rated at 42 mpg on the highway and a nicely-equipped model can be had for under $20,000. Like the Camry, Toyota has a formula for success on its hands in the Corolla, once again the best selling compact model ahead of the Honda Civic. Corolla sales climbed by 12.3 percent in 2014 on 339,498 units sold. Look at the compact segment and the Toyota Corolla and Honda Civic routinely fight for top honors. Also weighing in is the Chevrolet Cruze, Hyundai Elantra and Ford Focus. Beginning in 2014, the redesigned Nissan Sentra made a name for itself, as its sales soared by a whopping 41.9 percent on 183,268 units sold. 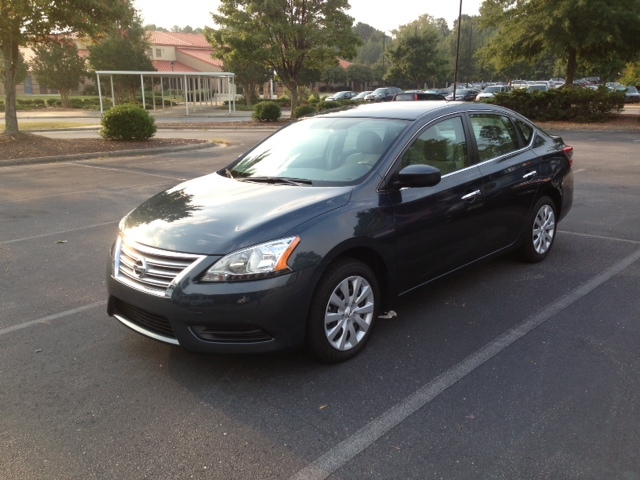 New for 2014, the current generation Sentra is larger, more enticing and roomier than ever. Like the Corolla, a well-equipped model can be hand for under $20,000, a price point that appeals to a lot of families. The continuously variable transmission also ensures excellent fuel economy with the FE edition rated as high as 30 mpg in the city and 40 mpg on the highway. Kia has created a cult-like following with its Soul “urban hatchback car.” It is nearly inconceivable to examine this model without its anthropomorphic hamsters. Kia has weathered some criticism that its hipster characters are too humanlike, yet buyers do not seem to mind. 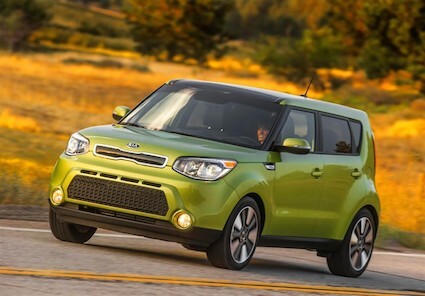 Indeed, in 2014 the second-generation Kia Soul was released, and this one has helped the Korean automaker gain market share. Sales surged by 23.1 percent last year on 145,316 models sold. What’s significant about that is both its Nissan and Scion competitors have struggled to serve the same market. Specifically, the Nissan Cube was canceled as the model year came to an end. Subcompact models typically do not sell especially well in the United States. Certainly, sales are greater than they were a decade ago, but with so many affordable and roomy compact models on the market, this sector is often bypassed for more spacious, but still affordable vehicles. Nissan, however, has turned that convention on its ear, by delivering sedan and hatchback versions of its Versa subcompact without trouble. The company has also taken a two-prong marketing approach to the segment, by selling the five-door hatchback as the Versa Note and the four-door as the Versa sedan. What buyers have found is a car that is unusually roomy for the segment, thrifty on fuel and can be purchased for about $15,000. 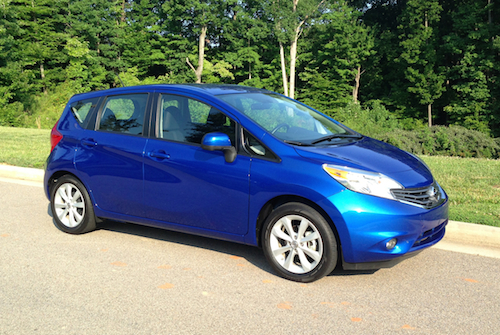 The Versa may not be a family car, but 139,781 buyers in 2014 found that it meets their transportation needs. A 19.1 percent sales upsurge underscores the Versa’s strength. 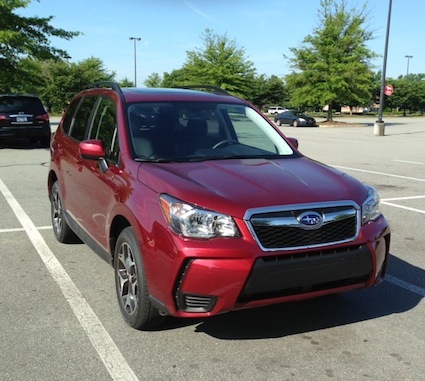 The Subaru Forester is an SUV that acts more like a tall station wagon. That appearance is not lost on buyers who appreciate the vehicle’s roominess, utility and handling characteristics. Introduced in 1998, the Subaru Forester is now in its fourth generation. The current iteration is not a radical departure from the previous model and that is just fine with buyers. For 2014, Forester sales surged by 29.4 percent to 159,953 vehicles sold. it was Subaru’s best selling model for the year and one of five model lines registering a sales boost of at least 17 percent. No wonder Subaru sales have doubled over the past five years — this once niche manufacturer has gone conventional. There are other models that could just as easily found a place on our list. The Chevrolet Cruze is now in its sixth model year, however its sales do not show the customary end of product cycle decline. Indeed, Cruze sales rose by exactly 10 percent in 2014 to 273,060 units sold. The BMW 3 Series may have been split between 3 and 4 model lines, but the combined interest for these compact luxury cars continues to grow. In 2014, sales for the two lines were a collective 142,232 units for a 19 percent increase over 2013. Sales figures supplied by Good Car Bad Car. Soul photo courtesy of Kia Motors. Ford’s smallest pocket rocket excites. The 2015 Ford Mustang has been promised to me, an upcoming press fleet vehicle that I’ve been anticipating for a long, long time. As I’ve been patiently waiting, an assortment of Lincoln and Ford vehicles have kept me busy, including one hot five-door hatchback that caught my attention and delivered a week’s worth of driving fun in its very small package. None other than a Molten Orange Ford Fiesta ST showed up, a color that perfectly matches this vehicle’s lively personality. 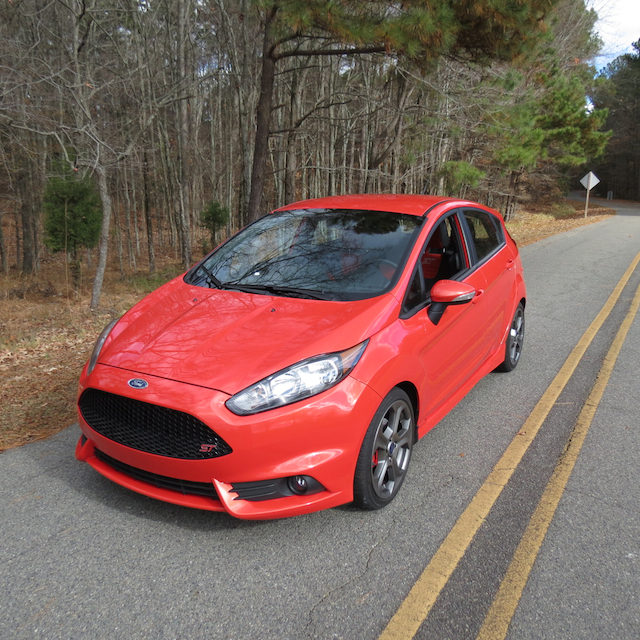 Just as a tiny cayenne pepper has an oversized bite, the Fiesta ST kicks out a lot of power thanks to its turbocharged 1.6-liter four-cylinder engine. Indeed, 197 horsepower may not sound like a lot in these days of 300 to 700 plus horsepower, but when it powers a vehicle weighing just 2,742 pounds, then you have to take notice. There are a number of changes that Ford made to produce an ST model for the Fiesta. Up front, the Fiesta prominently displays a one-piece, hexagonal-mesh grille with a bright red ST badge. You will also find a front chin spoiler with a deep central splitter, black headlamp bezels, a full ST body kit and a high mount spoiler. It also has a rear diffuser and twinned bright tip exhaust outlets. This model serves notice that it is ready to perform — more about that later. Inside, Ford took the standard cockpit and dressed it with multiple ST embellishments. All three analog gauges have red needles; the steering wheel is wrapped in leather and has an ST badge at its base. The gear shift knob is also wrapped in leather and has a satin chrome accent — you may have already guessed that the gear map is Molten Orange. 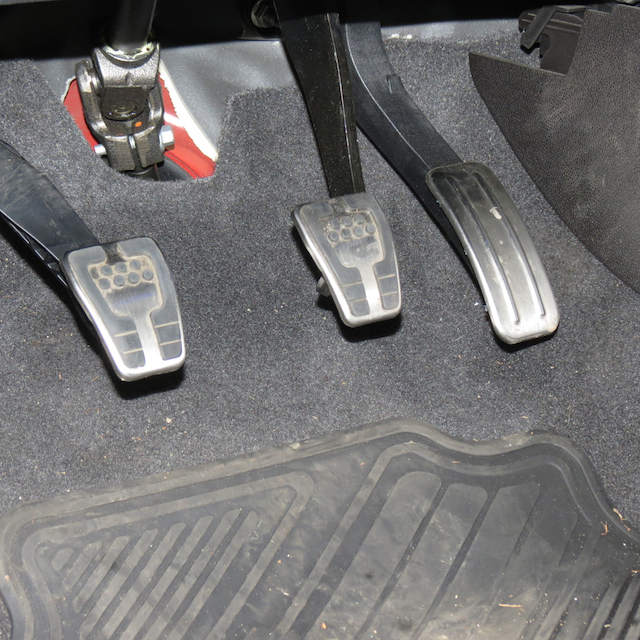 Aluminum racing-inspired pedals — accelerator, clutch and brake — are also present. 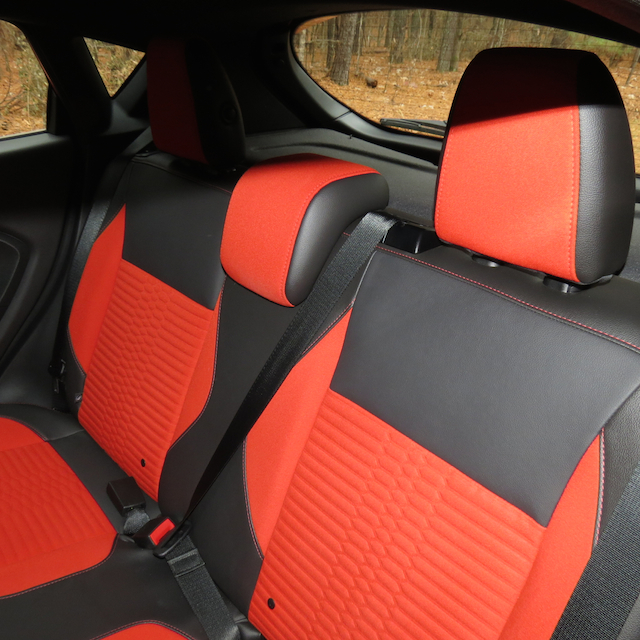 Most notably, the Ford Fiesta ST has Recaro bucket seats up front and a split folding Recaro bench seat to the rear. My test model, priced from $21,400 had several upgrades to bring its final price to $25,995. The Molten Orange metallic tricoat paint is a $595 upgrade, certainly worthwhile if you want to bring unmistakeable attention to this pocket rocket. 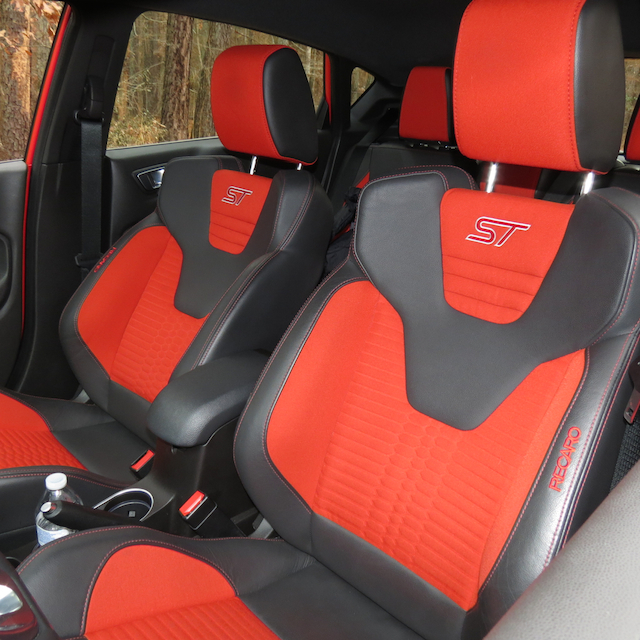 A $1,995 Recaro package upgraded the leathering and added heat elements for both bucket seats. Navigation added $795 and 17-inch premium painted wheels came in at $375. What makes the Fiesta an ST? For that matter, what does “ST” represent? Well, ST stands for Sports Technologies, a special performance level that is also applied to the Focus ST. Just this month Ford announced the creation of Ford Performance, a global initiative that unites Ford Racing, Team RS and Ford SVT under one umbrella. The new division will produce at least 12 new and updated models through 2020 — you can bet that the Fiesta ST will be one of them. 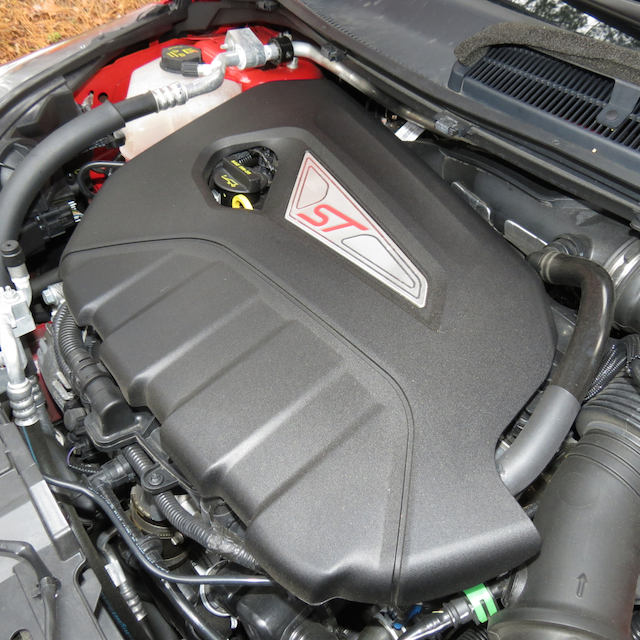 Both ST models come equipped with high-output variants of Ford’s EcoBoost engines. EcoBoost is a Ford phrase for turbocharged engines with direct fuel injection and variable valve timing. The company’s Bridgend, United Kingdom, plant builds these engines and also assembles both ST models. Thus, while all other US- and Canadian-sold Fiestas come from Mexico, Britain supplies us with the STs. Beyond the engines, these cars are outfitted with six-speed manual transmissions. They’re of the short-throw variety and should give anyone who isn’t familiar with a stick the confidence to drive one. ST models also come with enhanced European-inspired suspension and driving dynamics, three drive modes — standard, sport and OFF — and Bridgestone Potenza summer tires. 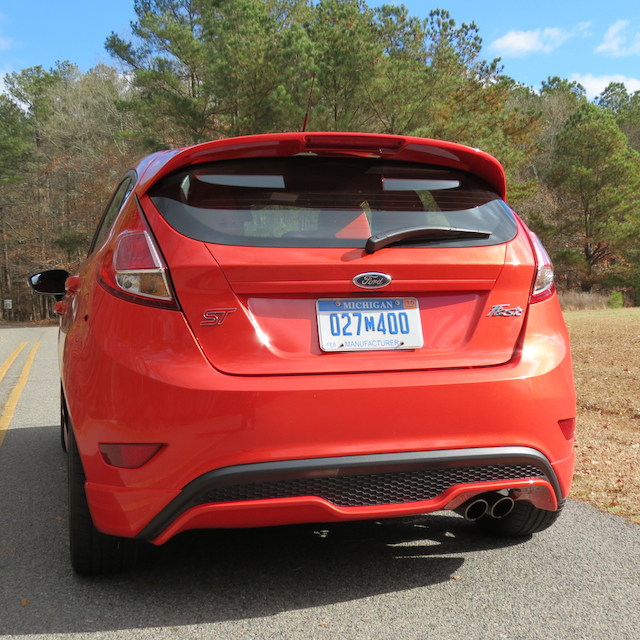 On the road, the Fiesta ST lives up to the hype. I might even say that it exceeds it. In my book, the Fiesta ST has the two essential attributes a small performance car must have — a turbocharged engine and a manual transmission. To begin, the engine bangs out 197 horsepower and 202 foot-pounds of twist. Those numbers blow away the 120 horsepower and 112 foot-pounds of torque with the normally aspirated engine. Credit EcoBoost technology — turbocharged direct injection — with giving the ST’s engine the extra bite. Ford didn’t stop there and for that you’ll be immensely grateful. The front-wheel drive Fiesta ST benefits from torque vectoring control, technology that utilizes the hatchback’s braking system to adjust the speed between the two front wheels. The result is improved handling while cornering and a reduction in understeer, the latter the bane of front-wheel drive cars with high performance engines. I understood the full impact of this system while taking the Fiesta ST on my favorite drives — the twisty roads where I’ve given the likes of the Corvette Stingray, Dodge Challenger, BMW 4 Series, Porsche Cayman S and other models a work out. Rear-wheel drive all, each one handled the many twists and turns with ease. I’ve taken a number of all-wheel drive vehicles on the same loop, but very few front-wheel drive models. Unless they’re properly equipped. 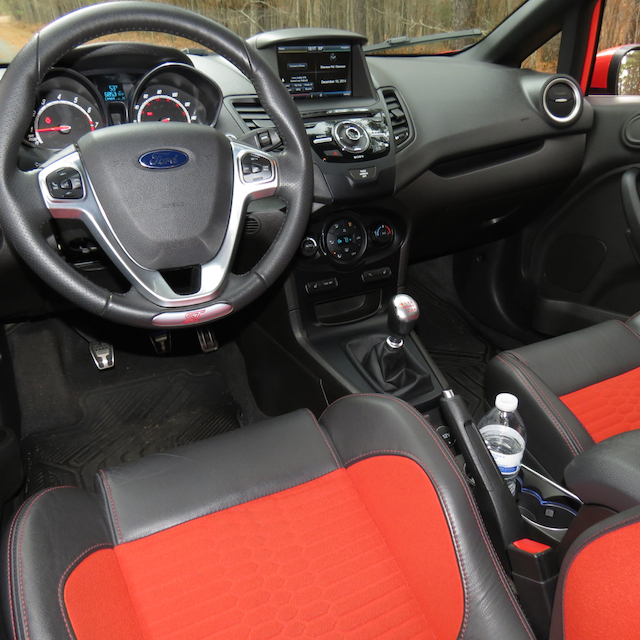 Wisely, the Fiesta ST utilizes short-throw shifting, making gear shifts virtually a non-event. This was important to me on several road expanses where shifting is frequent and I simply wanted to concentrate on the steering. Get ready for an unmistakeable, but slight side-to-side shift front body feeling as you take a curve and plunge into every twist of the road. You can feel torque vectoring control at work — it kicks in just before you think the Fiesta ST is going to move out of position. The feedback is pronounced and I anticipated the same, giving me the confidence to match my usual back road antics. Without a doubt, I wouldn’t have dared half the maneuvers I tried with an ordinary front-wheel drive model. Handling certainly is different from traditional rear-wheel drive sports models, but it still provides an enjoyable experience. 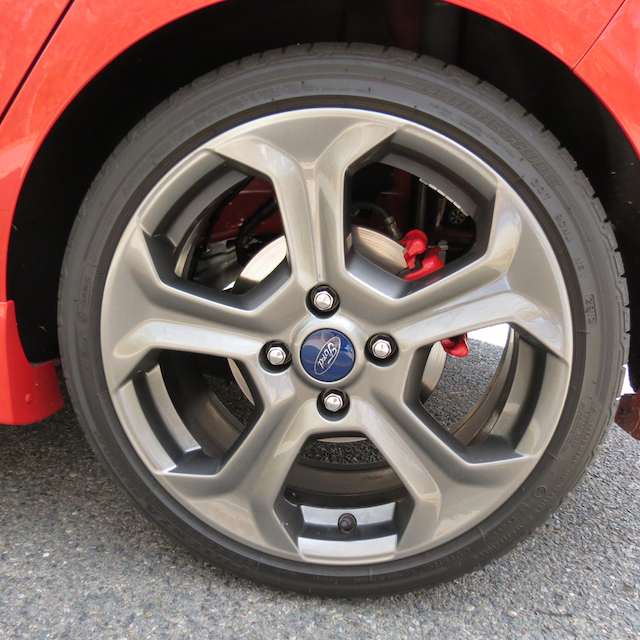 Ford Europe made a number of upgrades and enhancements to the ST’s suspension system that improves its handling. Up front, the suspension received changes to the springs, dampers, stabilizer bar, knuckle and a tweaking of suspension geometry. The Ford SVT team also adjusted the roll center position for added roll stiffness, the camber for stiffness and they shortened the steering arm length. Braking improvements over the base model has four-wheel disc brakes all around. Larger brakes were placed up front with pad thickness bumped up by about 60 percent. To the rear, new springs and dampers are also present along with thicker twist beam gauge material, what Ford says comes in nearly 75 percent stiffer than the base model. The US spec model weighs about 130 pounds more than the European version, with thicker bumpers and a full size spare present. Even so, Ford engineers worked diligently to ensure that the two versions handle nearly the same. Step on the accelerator and make quick work of the gear shifter and this model maintains its composure on the straightaway. Turbo lag is minimal and when you’re putting down for full throttle effect, overboost kicks in and you should nail 0 to 60 mph in about 7 seconds. It seems faster than that and it is certainly faster than most anything else in the segment. 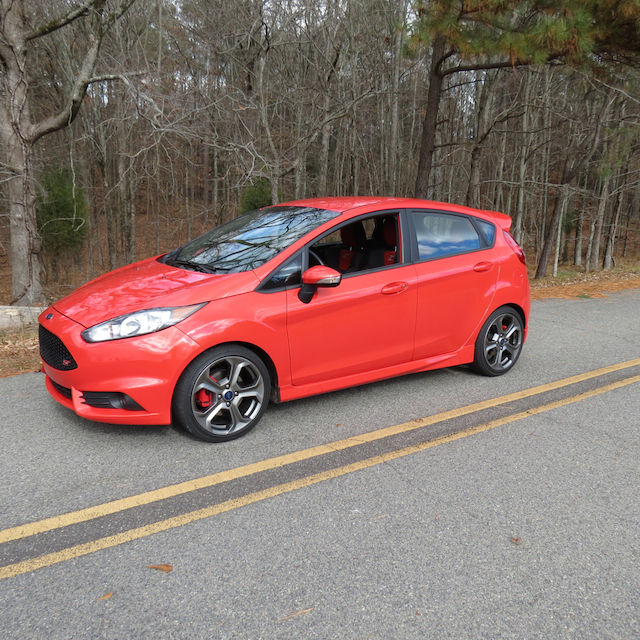 Ford equips the Fiesta ST with Bridgestone Potenza rubber — summer-only tires that felt heavy on one 24-degree morning, but were absolutely fine as temperatures warmed to 50 degrees and my serious driving commenced mid-afternoon in central North Carolina. Credit the tires and the model’s lightweight frame with contributing to the Fiesta ST’s excellent braking characteristics. So, why would anyone want a Fiesta ST? Likely, you’re already fond of compact cars and you aren’t particularly put off by something even smaller. In the subcompact class there are other performance models, including the Mini Cooper S and the Fiat 500 Abarth. The former choice is $10,000 pricier than the Fiesta ST and will likely cost you more to maintain in the long run. The latter has some serious kick, but it is simply smaller than the rest. And of course there is the Volkswagen GTI, the most popular small performance model. Like the Mini, the GTI makes for a pricey proposition. Now that Ford has consolidated its performance models under the Ford Performance banner, we’re likely to see a host of new products that will appeal to people who want something other than the iconic Mustang. The Fiesta and Focus may have what you want and at price points that simply must be considered. 2014 Ford Fiesta ST photos copyright Auto Trends Magazine.